Beachside restaurant complemented by an adjoining café for more casual dining. : Chef Serge Dansereau has been in this Middle Harbour location since 1999, but his career stretches back further. From the time when he was executive chef at the prestigious former Regent Hotel in the city, he has been a leader in shaping Sydney dining. 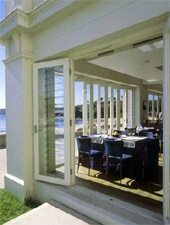 There he pioneered the sourcing of fresh local produce by chefs, and that same principle still shapes his menu at The Bathers’ Pavilion. As the name implies, the gracious building is a former changing-pavilion just yards from the shoreline, and the view by day or night is a fine backdrop for dining. The menu reflects the changing seasons too, and warmer weather may see freshly shucked Sydney rock oysters, smoked trevally with crispy squid or duck breast with orange and miso. Winter brings heartier dishes: seared venison; duck magret with confit peach, pistachio cream witlof, crisp tongue and kimchi sauce. Desserts such as lemon mousse and licorice anglaise, or palm sugar meringue with passion fruit sorbet always delight diners. There is a dégustation menu and a separate full vegetarian menu, as well as a Chef’s Table for 12-16 guests, offering four courses with carefully matched wines. The Bathers’ wine list is eclectic and widespread, an ideal foil for the “French cuisine with a twist,” which is Dansereau’s style. At one end of the building, the Bathers’ Pavilion Café, also open every day, is an ideal place for a casual breakfast, a glass of wine or even a light meal, and perfect for small functions.